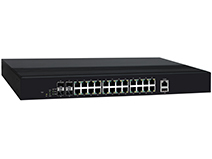 This switch is an industrial Gigabit managed Power over Ethernet Switch is designed with 24 10/100/1000M PoE+ ports and 4 Gigabit SFP slots for highly critical PoE applications such as real time IP video surveillance, WiMAX systems and Wireless APs. All of the 24 ports of the switch are compliant with both IEEE 802.3af PoE and IEEE 802.3at high power PoE standards and can deliver up to 15.4W and 30W power per port to enable the high-power requiring devices, such as Wireless Aps, PTZ and dome network cameras, etc. IGP-72404M supports 4 Gigabit Copper/SFP Combo Ports to uplink to servers, storage, or other switching devices for long loop reach applications. Ring network topology ensures the reliability of the connections among all the switches in the network. IGP-72404M supports ERPSv2 with easy to set up user interface, which allows it to recover from network disconnection in less than 20ms with 250 IGP-72404Ms connected in a ring network topology while transmitting/receiving data at full network speed. Also, IGP-72404M supports multiple ERPS instances, allowing different VLANs have their own ERPS instances. IGP-72404M comes with a USB port for connecting a USB storage device to the industrial switch. Configuration files, switch system log and firmware can be stored in the USB storage device for the switch to access. When a USB storage device is connected to IGP-72404M, it will load the configuration file in the storage device and apply all the settings, saving on-site installation time and effort.